I’m pleased to announce that West Coast painter Peter Scherrer is arriving on March 11 for a seven day artist’s residency at Two Coats of Paint. I first saw Peter’s lush, mysterious landscape paintings in SEASON’s presentation at VOLTA last year. 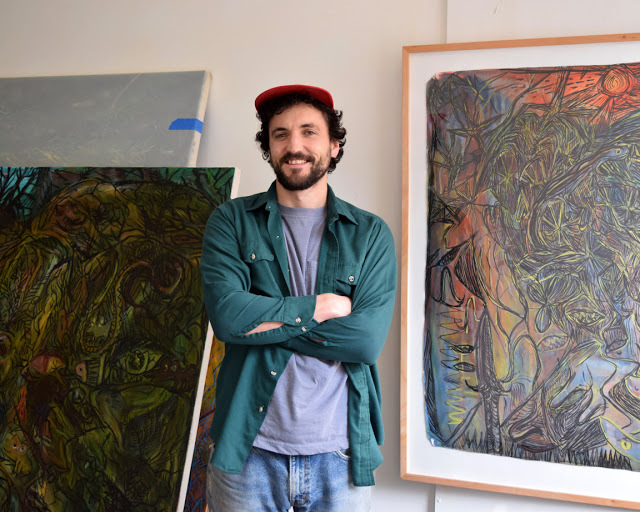 Peter regularly visits New York to check out galleries, museums, and artist friends, but this trip he’ll be able to arrange local studio visits and share his work with the NYC art community. Peter Scherrer, Salamanders, Daggers, 2014, watercolor on paper, 40 x 54 inches. A native of Washington state, Peter earned a BFA at the California College of the Arts in San Francisco. He returned to Washington in 2005 and settled in Bellingham. Surrounded by the lush northwest environment of his childhood, he has made increasingly complex paintings that combine the nature-gone-wild flavor of Henri Rousseau’s jungle scenes with the cheeky verve of the Chicago Imagists and the Surrealist automatism of painters like André Masson and Joan Miró. He builds his paintings in layers, using disparate approaches interactively. 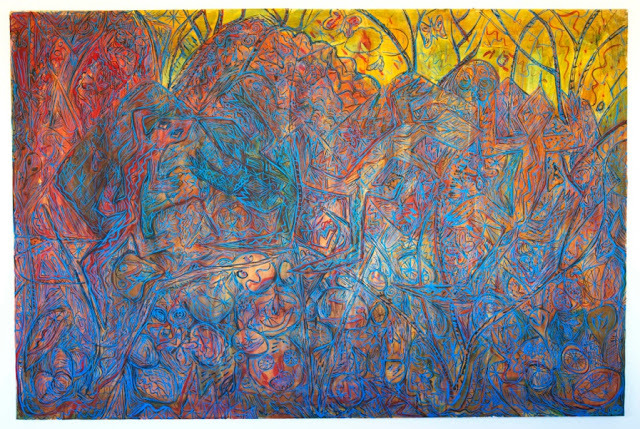 For instance, traditional romantic landscape painting techniques might find themselves intertwined with a 1990s grunge poster/stoner drawing sensibility. In Peter’s hands, this kind of eclecticism is galvanizing. creates views into fantastic worlds where night owls melt into trees while snakes hide in the branches. For Mr. Scherrer, even his humble backyard holds amazing energy that is overwhelming and dreadful. Dense lines in ink or oil set a framework for the atmosphere to become a vibrating and heavy cloak over nature. I look forward to spending more time with Peter and his work. If you see him around town, please give him a warm welcome. 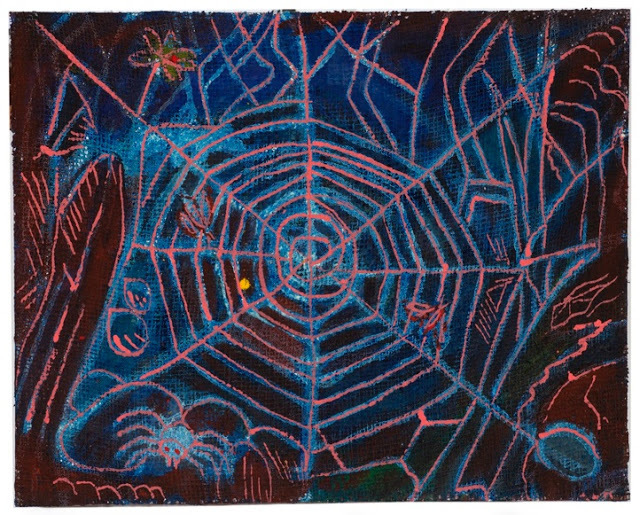 Peter Scherrer, pink web, 2014, oil on burlap on panel, 16 x 20 inches. 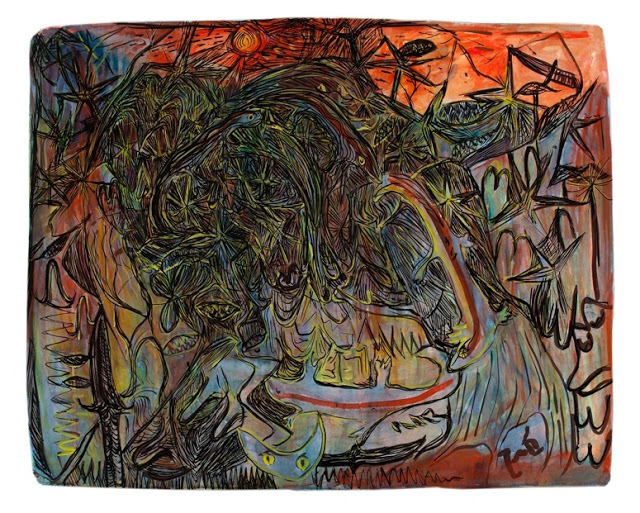 Peter Scherrer, Four Lizards, 2014, watercolor on paper on panel, 72 x 48 inches.